Beers served on Nitrogen boast a thick, creamy head with delicate soft carbonation. Perfect for Stouts and Bitters, but great to experiment with as well! 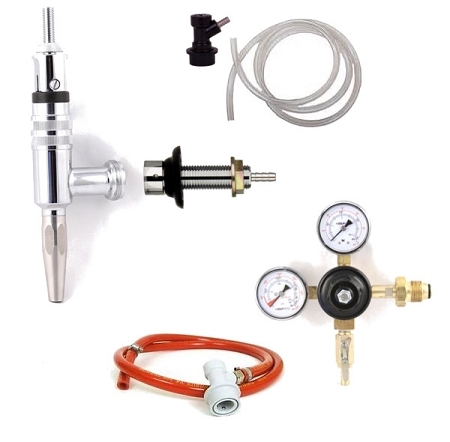 This kit is designed for adding a homebrew Nitrogen tap to your kegerator or keezer. This kit does NOT include but DOES require a beer-gas tank. These tanks are commonly 75% Nitrogen and 25% C02 and can be purchased at most welding supply stores. Simply keg your homebrew, and carbonate with normal C02 to roughly 2 volumes. Then release the head-pressure, and attach your Nitrogen Kit. Bring the PSI on the regulator between 25-40 PSI and serve!